No quicker than I could say good things about this device, however, people were trying to shoot it down, with the price playing a pretty large factor in that. 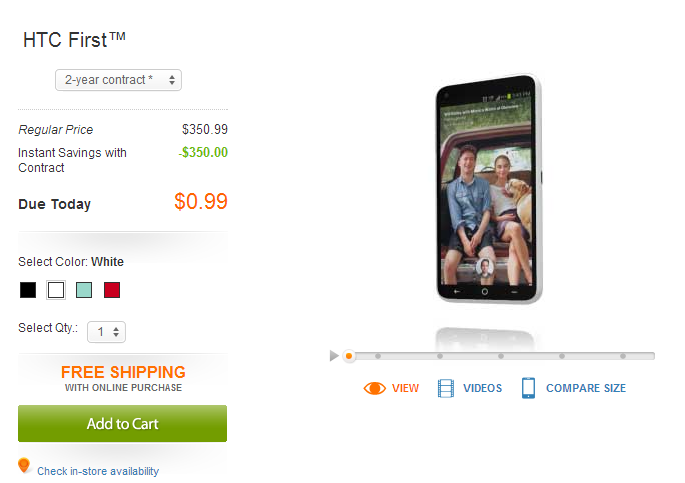 The argument, of course, was that "this phone is $450 off-contract, and that's one hundred monies more than a Nexus 4!" LTE lovers responded with "but I don't like HSPA+!" And the argument went from there. The truth is, though, most consumers don't buy devices off contract. They fork over however many moneydollars the carrier wants, sign the dotted line, and walk away with a new smartphone. And for AT&T customers, a $99 HTC First is more affordable than a $350 Nexus 4 – there's simply no arguing that. Today, though, AT&T has knocked the First's price tag down another notch: the phone is now $0.99 with a two-year agreement. 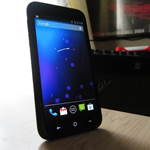 It didn't stop there, either – the off-contract price has also been dropped to $350, putting it on the same economical playing field as the Nexus 4. Now, don't read that out of context, I'm not suggesting the First should be purchased over an N4, but if you don't want to be tied down and have a strong desire for LTE on a stock Android handset, the First is absolutely your best choice. Of course, if you're looking for a stock Android handset that only costs a dollar, the First is your best choice in that department, too. Basically, don't be afraid of this phone just because it's associated with Facebook. It's stock, it's snappy, the form factor is great, and it has the el tee ees. So long as the subpar camera is something you can look past, there's not a lot to dislike about this device.